16/9/09 – Acquisition – Versailles, Musée national du Château – A year ago, we pointed out the fund raising appeal for the acquisition of a national treasure, the central section of a Savonnerie rug commissioned by Louis XV for the chapel at Versailles (see news item of 14/8/08). A patron was found : the oil company Total has just donated the work, purchased from the Galerie Kraemer in Paris for two million euros. Woven between 1723 and 1728 at the Manufacture royale de la Savonnerie in the workshop of Jacques de Noinville according to the models produced by Pierre-Josse Perrot and Jean-Baptiste Belin de Fontenay, five rugs covered the tile floor of the nave of the chapel for major events. Each was made up of three sections or compartments. The set was sold during the Revolution or given as payment under the Directoire to suppliers. The element acquired by the château was in the collections of the Viennese branch of the Rothschild family around 1860 but was then sold in the late 1950’s. The décor recalls that of the rug from the same factory, from a cartoon executed by Pierre-Josse Perrot, already acquired by Versailles last year (see news item of 22/10/08). 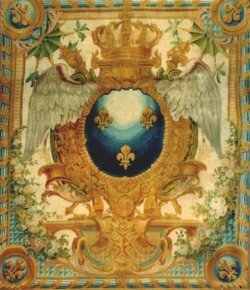 The French coat of arms also appears there with, at the top, a closed crown of fleur de lys surrounded by collars of royal orders and held by open wings, accompanied by royal scepters. Its fragile condition, despite its fine state of conservation, requires it to be kept away from open light. Thus, it will not be exhibited in the chapel for both this reason and the fact that it is only one element of the original rug which cannot be reconstituted again. The work will therefore be presented in a temporary manner in one of the rooms of the château, currently the Salon d’Apollon.